The price is for 1 pair (2 pcs), if you buy 2 pair(4 pcs), we will send the Factory full matched tubes to you. ▲ Rg2is used in two tubes. Crystallized carbon grey coating inside the tube: This makes the TII series tubes to be a ‘grey bottle’, not a ‘black bottle’. 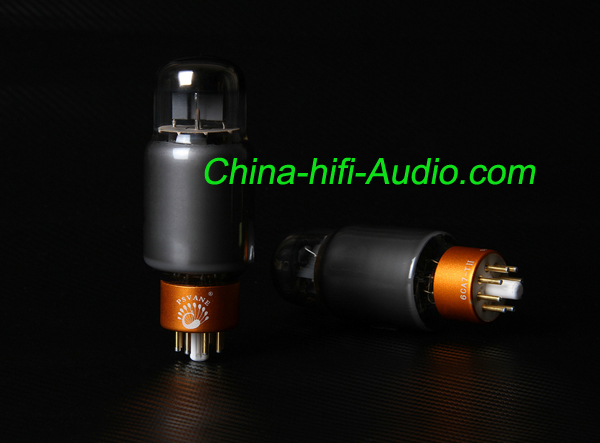 The Crystallized carbon coating technology used in vacuum tubes have been patented by Psvane Audio in China and pending abroad. The benefit of the Crystallized Carbon coating will improve on absorbing random electrons inside the vacuum tube and dissipating heat more efficiently under extreme temperature, which will further enhance the stability of the vacuum tubes. Teflon Base with Oxidized Aluminum Collar: instead of using fragile ceramic base, the TII series tubes use low conductance and highly durable Teflon materials for the base (no including the guide pin in the middle) to improve on anti-corrosion and anti-breakage. The brass-color sandy Oxidized aluminum collar around the Teflon base is anti-corrosion as well – no more finger prints and oxidization on the tube base with time of use, and your tubes will maintain a prestige condition for a long time. Product logo engraved on the base, not printed on the glass enclosure: As many tube amps have tube sockets installed in various directions based on circuit layout, previously the printed logo on the black bottle tubes may face inconsistent directions. TII series have logo only engraved on the base so your amp will maintain a consistent and highly desirable appearance for all TII series tubes. Higher quality glass enclosure: Higher quality glass is used for the new TII series to offer a better hand feel of the tubes, plus slightly heavier weight (approx 10% among all models) than previous series. Last but not least – Sound Quality not a tiny bit less: TII series offers not a tiny bit less sound quality than the previous T-series. The new coating materials offer an even better music presentation in terms of minor 3D imaging improvement, layering and clarity. You will not lose anything in terms of sound by going for the latest and newest TII series if T-series are phased out and will gain all the greatly improved workmanship mentioned above. There is the full series(all tube type) of PSVANE Vacuum Tube below.